A sketch of Gunung Merapi, made by Franz Wilhelm Junghuhn in 1836. The shape of the mountain has altered a lot due to the following outbreaks. Indonesia is deeply shaped by volcanic activities. In fact, most of the Indonesian islands owe their existence the volcanic activities on the ground of the oceans of this world region. It's part of a 40,000 kilometers long chain of volcanos, reaching from New Zealand along the Andaman Sea to the South China Sea between the Philippine Islands and Vietnam. It then continues along the Chinese coasts, then down the shores of North and South America. The volcanic ring of fire is caused by tectonic plates, pressing against each other, lifting the grounds and opening cracks to the inner earth. Two thirds of the world's active volcanos are along the pacific ring of fire. 90% of world's earthquakes occur along the ring. The most tsunamis have their origins around Indonesia. 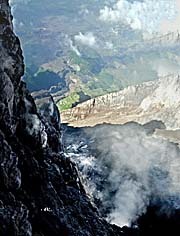 A great deal of the ring's volcanos and the most active ones are situated in Indonesia. This country has the world's highest density of volcanos. One of them is the Merapi (2911 m), in central Java. The Merapi has erupted already more than 80 times in his history. That makes him one of the most active volcanos in the world. Besides he is one of the most dangerous ones, a so called 'high-risk' volcano. Moreover, Mount Merapi is a celebrity. Bigger Merapi eruptions are a topic for the world news. 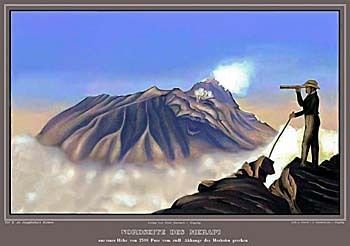 Merapi means 'fire mountain'. 'Meru' is sanskrit for mountain, 'api' stands for for fire. Around the Merapi are 3,000,000 people living. In Yogyakarta alone live 500,000 people. Near the Merapi, magnificent Borobodur (30 kilometers) and Prambanan are situated. In the 2010 eruption Borobodur was covered by a three centimeter thick layer of acid ashes, harming the temple's surfaces, particularly the sophisticated reliefs. Here in south Java the Australian tectonic plate is sliding under the Euroasian plate. 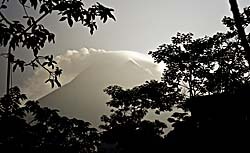 Eruptions around the Merapi started about 400,000 years ago. Scientists discovered under the Merapi a huge fluid formation. Speculations about a very big magma chamber, much bigger than under the verymost other volcanos on earth, are around since then. The upper part of the mountain is completely free of vegetation. 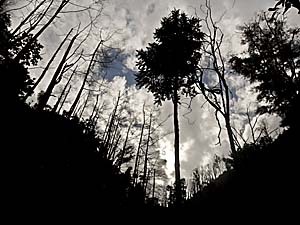 In the lower parts grow bigger casuarina (an Asien pine tree) forests. Climbing Gunung Merapi is possible for everybody in a good shape and with open eyes. However, there are some things to consider and to be careful. Check the page 'Climbing Mount Merapi' for a personal experience on a hike up to the volcano's peak. The first photo shows the whole mountain seen from an opposite slope in the village of Selo, north of the volcano. The mountain changed it's appearance in it's 400,000 years of existence again and again and again considerable, also in the last great outbreaks of 1872, 1930 and 2010. The third photo offers another view on Merapi from above, seen from neighbouring Mount Merbabu. The second image shows a small section of the many wrinkles in the surrounding landscapes of the fire mountain, which were certainly engraved by streaming lava in the past. Approaching the vegetation border one get's a first glance on the naked peak (images 4 & 5). When coming up the track from Selo, one has to climb up high above the caldera itself. The draining off is in the left part of image 6. That's the way the lava went out in the great outbreak of 2010. Strong winds blow around the peak. Down in the crater one can also recognize two 'mudholes'; that's the opening and connection to the magma chamber below the volcano (image 7). If the connection is blocked, at a new eruption the pressure would grow heavy before the lava finds it's way out by a great crack, blowing boulders and volcanic matters kilometers high into the air. Image 8 shows the last slope one has to climb up before reaching the peak, and it is a difficult climb, for the ground is softer like sand, rather like dust, and it's a heavy strain to make progress. The way back down is therefore much easier. To the northern directions one has magnificent views over the mountainous landscapes of central Java. In late forenoon frequently thick fog (clouds) appear, and it's time then to go back down. The sight might get that bad that it's difficult to find the track again. People got lost due to bad sight already. The peak of the mountain reaching above the clouds is Mount Merbabu (image 10). It is also possible to reach the peak from Kaliurang, means from the other, southern side. But the distance is much further and to find the right way a guide is necessary for anybody who doesn't know the way. Image 11 shows the Merapi from the southern side. The landscapes here are abandoned from infrastructure; that's the direction where the lava and pyroclastic streams went down in the huge 2010 outbreak. There is another inactive volcano on east Java, bearing the same name: Gunung Merapi. 'Gunung' means simply 'mountain' in Indonesian language. Both Merapi's are mountains and it's therefore easy to mix them up. Another volcano on Sumatra bears the name Marapi. For the Merapi typically is the outbreak of hot ashes and boulders with a temperature above 700°C. On an gas padding these ashes and boulders can slide in a rapid speed of more than 300km/h almost noiselessly downwards the slopes (it's called a pyroclastic stream). The hot and poisonous steams alone can kill people when being breathed. It's even worse than the typical Indonesian 'Kretek' cigarettes. Other eruptions caused lahars ('lahar' is an originally Indonesian word and means avalanches of mud and gases). Also typically for Gunung Merapi is the very stringy kind of lava. It's not spilling quick lava streams, but forming lava 'domes', who creep around the caldera or even block the caldera inside. In this case it comes to an increasing pressure due to following lava from inside until the top of the caldera bursts. Matter, ashes and gases might be thrown up then for kilometers into the sky. However, the 2010 outbreak left the caldera 'open'. Smaler eruptions occur frequently every two or three years. Bigger eruptions occur in average every ten to fifteen years. Huge eruptions were in 1006 (covering Borobodur under a thick layer of ashes), 1786, 1822, 1872 and 1930. The 1006 outbreak was of particular historic dimensions; whole central Java got covered with a layer of volcanic ashes. The outbreak caused the breakdown of the empire of Mataram and the widely depopulation of central Java. The following political power vacuum in Java favoured the outspread of Islam. 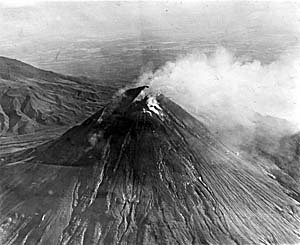 An aerial photograph of Merapi's 1930 outbreak. Image by Tropenmuseum Leiden. One of the newer eruptions lasted incredible eleven years [!] long. It started in 1992. The outcoming lava formed a lava 'dome' around the mountain. This dome grew and grew, until it reached the caldera. At the end of 1994 the dome broke almost completely together, forming a huge slide which killed dozends of people. Another lava dome grew up. 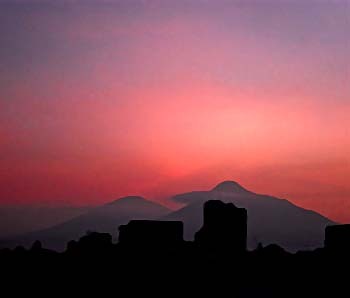 After the eruptions ended in 2002, the Merapi looked completely different than before. The last eruptions were in 2006 and 2010. In October 2010 the Merapi pushed a 1.5 kilometer high pillar of ashes and smoke out. In it's next push in November the mountain pushed rocks and ashes 4 kilometer high up. More than 70 people died, the security zone was expanded up to 20 kilometers around. 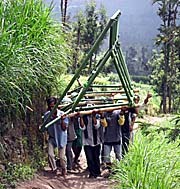 Though, many villagers remaind in their homes. Yogyakarta airport became closed. In the following days the eruptions became heavier, pushing clouds of ashes 6 kilometers up. At the end of November official estimations numbered 324 dead, more than 400 injured, many people missed, 26 villages destroyed, 390,000 people in evacuation camps. It was at least the heaviest outbreak since the one in 1872. The Merapi is under strict observation of several seismographic stations around. Palace officials of the Sultans palaces in Yogyakarta and Surakarta sacrifice annually and ritually to ease down the spirits of the Merapi. They walk up half the way to the summit in larger processions. It's believed here widely that there is an ogre spirit living in the caldera. Others claim there were a spirit kingdom inside the mountain. The authorities who make claims on these spiritual matters are shamans. One of these shamans advised villagers before the 2006 eruption not to evacuate, although there were already evacuation requests. Half the way up to the top of the Merapi there lived Mbah Marijan, a spiritual guard who served the sultan of Yogyakarta as well as the mountain spirits. He was in the eyes of many locals as well as in the opinion of the sultan himself a much more important authority than scientists ever could be. It was strongly believed he could predict the mountains behaviour. Mbah Marijan faced the physical reality in the 2010 eruption, but he didn't find time to digest it. He died, and with him fifteen people who were in his company at that moment.